My kids go to a non-traditional private school. They are only in school three days a week, they say the Pledge of Allegiance daily and are expected to complete a remarkable amount of homework on the two days they aren’t in school. Those three features may seem a little strange to some.. But the thing about our school that seems to get the most reaction from people is this: All lunches must be provided from home (that’s right.. No “hot lunch”) and the children are only allowed water to drink. I love this. It reassures me that my children will eat well, even when I’m not around. One of our lunch box staples for our kids is yogurt. They love yogurt and I love that it’s good for them. When I was selected to be a Stonyfield Farms Yo-Getter (Their ambassador program) I was thrilled about it. Not long after I was selected, they provided me the opportunity to review the new Weelicious cookbook by Catherine McCord. Weelicious Lunches. Knowing that it’s my job to send a healthy lunch with my child to school, and then provide lunch at home for my kids on the days they are home from school, I was thrilled at the prospect! One of Catherine’s “Pantry staples” is plain (or Greek) yogurt. This was exciting. New ways to implement a lunchbox staple into their lunch, along with new lunch ideas all together. Right before my cookbook arrived, I was diagnosed with a subchorionic hematoma and put on restrictive rest. No extended periods of standing. This meant no time in the kitchen. However, I spent some time flipping through the cookbook and realized how simple, yet so yummy, her lunch ideas were. Perhaps I could pull this off after all. I waited until some of my restrictions were lifted and set out to find a good lunch idea! 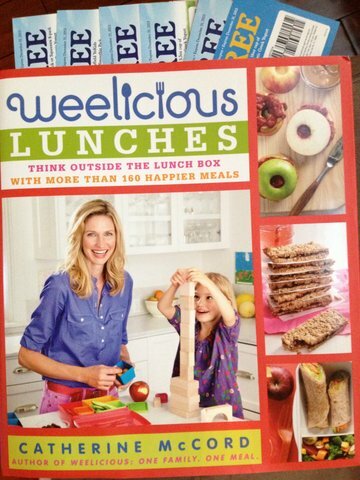 In the Weelicious Lunches cookbook, you’re going to find ideas to fit all your needs. Whether that be a soup, a salad, a snack, perhaps you’re looking for a new sandwich or creative dip idea. She’s got you covered! 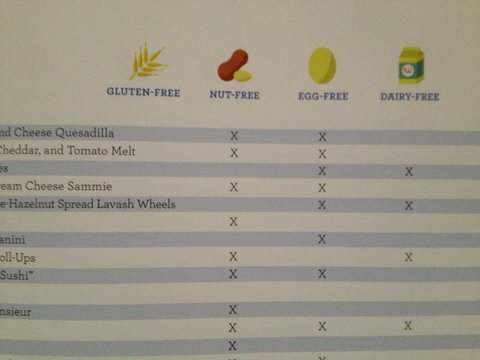 The book is also filled with helpful tips, and my favorite: a recipe allergen guide. I was drawn to the Veg-Wee Dip made with plain yogurt. It’s a close competitor to your traditional Ranch dressing, and considering my toddler drinks ranch dressing like no one’s business.. it was a sure hit! Its a great multi-purpose dip. From veggies to sandwiches, it adds a fun spin on lunch box food. Catherine has given up permission to share a recipe from the book with you, and as good as the dip is, I want to give you a more creative and fun recipe to send your kids off to school with.. and if they’re like my kids, you may want to send some Veg-Wee Dip along for them to dip it in! Most kids love chicken nuggets. Most parents are frightened by what may be contained within them. That’s why I’ve chosen to share with you Catherine’s “Easy Chicken Nuggets” which are also easy to freeze and enjoy later! 2. Place the chicken, mashed potatoes, parsley, garlic powder, onion powder, and salt in a food processor and pulse until smooth and combined. 3. In a shallow bowl or plate, combine the bread crumbs and Parmesan. 4. With moistened hands, roll 1 tablespoon of the chicken mixture between your palms and flatten into “nugget” shape. 5. Gently press the nugget into the bread crumb mixture to coat. 6. Transfer to lightly sprayed or greased cooling rack on a baking sheet lined with foil. 7. Lightly spray the nugget with cooking spray. 8. Bake for 20 minutes, or until crispy outside and cooked throughout. 9. Serve hot with honey mustard, ketchup or Veg-Wee Dip. Note: If you want the nuggets to be golden brown, place them under the broiler for an additional 2 minutes after cooking. To Freeze: After step 5, place the chicken nuggets on a sheet tray and freeze for 30 minutes. Transfer to a ziplock bag, label, and freeze for up to 4 months. To bake, do not defrost; just add 3 to 5 minutes to the baking time. I am so excited to be able to share this cookbook with you and both Stonyfield Farms and Catherine McCord’s dedication to healthy, organic food options your kids are sure to love. I am also excited to say that Stonyfield Farms and Catherine McCord have graciously given one of you the chance to win a copy of Weelicious Lunches along with a fabulous collection of Stonyfield Farms coupons to get your healthy lunches off to a great start! Note: I was provided with the Weelicious Lunches Cookbook and Stonyfield Farms coupons for this review. The opinions expressed are my own and I was not paid to write this review. 6 Responses to "A Weelicious lunch!" I want this! Jack has decided to boycott sandwiches at school even though he will happily eat them at home. I need new ideas for his lunch box. I love the weelicious website and have tried a few recipes, would love the cookbook! Veg-wee dip! Cute name. 🙂 I’m excited to check this out – always looking for new ideas on stuff to feed the toddler. Brenden = pickiest eater ever. I’m always looking for creative ideas, especially as Joel is moving away from traditional baby food! I need some more creative lunch ideas. 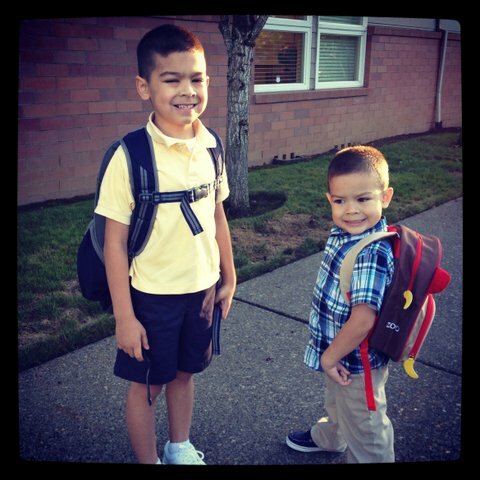 Sawyer’s preschool is also nut-free so I’d love some ideas to bring when it’s our family’s snack day too! Trying to prepare for lunch prep for my first at school all day, while looking for fun and new ideas for my two little ones at home! This looks like my answer! !